Remember this post we made like 3 years before we actually had a baby? I remember making it, eating it, really liking it!, and going, "I'll definitely have to make this if we ever have babies..." NOT EVER THINKING FOR A SECOND I ACTUALLY WOULD. But I did! I so did! Man, have I made the heck out of those pancakes for Luke! We friggin LOVE the dang things. Pretty much the easiest breakfast to prepare for him, aside from a piece of cold bread or a frozen waffle. His requests, not mine. Kids. Amirite? Homey will cry actual tears if he requests a frozen waffle and I dare toast it up for him. Not. Even. Joking. 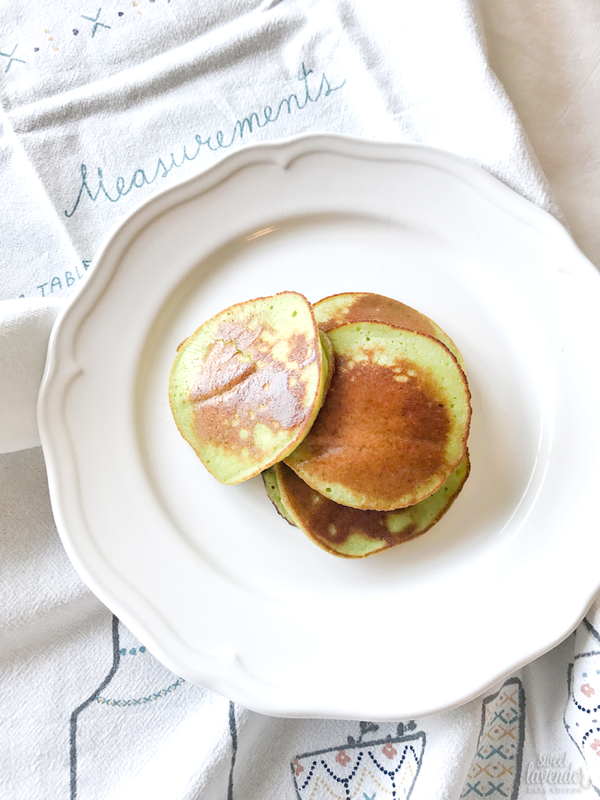 Anyway Luke and I have made these pancakes so many times that I started playing around little by little by adding healthy ingredients here and there. Why? Because although they're already full of nutrients (and yummy for him), I'm always looking to push the border as far as I can with as many vitamins and minerals as possible, per meal. I have found what we consider, the perfect addition to these already pretty darn good pups. With just a bit of fresh organic baby spinach and some coconut flour to make up for the added moisture, they're scarfed down by my almost two year old in no time flat! And I love that I've now added in all the health benefits spinach offers as well as that found in coconut. PLUS it remains gluten and grain free! Score. Plus plus, it's JUST as simple to make and are sweet as is- no need for added syrup. 1. In a blender or food processor, add all of the ingredients, except oil/ghee. Blend until completely combined. Let sit a few minutes to allow the coconut flour to absorb the liquid and then blend again to reincorporate. 2. Preheat your pan over medium to medium low heat. Add in a few teaspoons of oil or ghee and pour 1/4 cup of batter into pan, leaving plenty of room between pancakes. Lightly spread out batter. Allow to cook for a few minutes, until bubbles form and sides are getting golden brown. 3. Gently flip and allow to cook on other side another few minutes, until cooked through. Enjoy right away or allow to cool completely, pack up in a freezer bag with parchment or wax paper between layers, and freeze for easy breakfasts later on! To reheat, simply warm in a low oven until heated through! Some tips: these are a lot easier to flip if pancakes are made on the smaller side- a 1/4 cup poured into the pan at a time is plenty. Keep an eye on them. 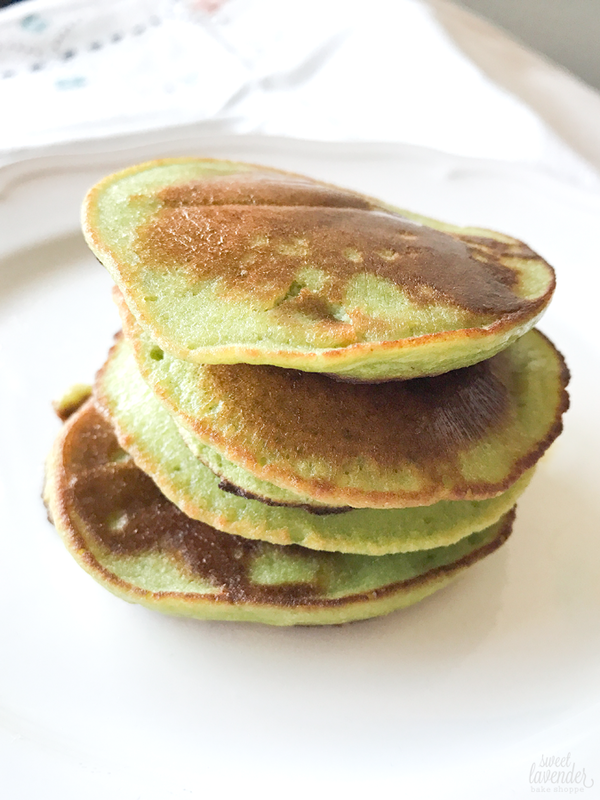 Because of the sugar content in the bananas, they can burn easier than regular pancakes.